I’ve become pop obsessed. I kicked off summer with the purchase of a Zoku quick pop maker and I’ve had frozen treats on my mind ever since. My Pinterest board of “recipes to try” has been taken over by these frosty summery desserts and I found even more inspiration upon ordering the People’s Pops cookbook after reading about it in the Wall Street Journal. Yes, you read that right. The venerable Wall Street Journal recommended a book on popsicles. I’m patting myself on the back at the thought that I haven’t regressed to a 9-year old’s cravings for dessert on a stick, but instead am just swept up in a trend that even the suits that read the Wall Street Journal can’t resist. 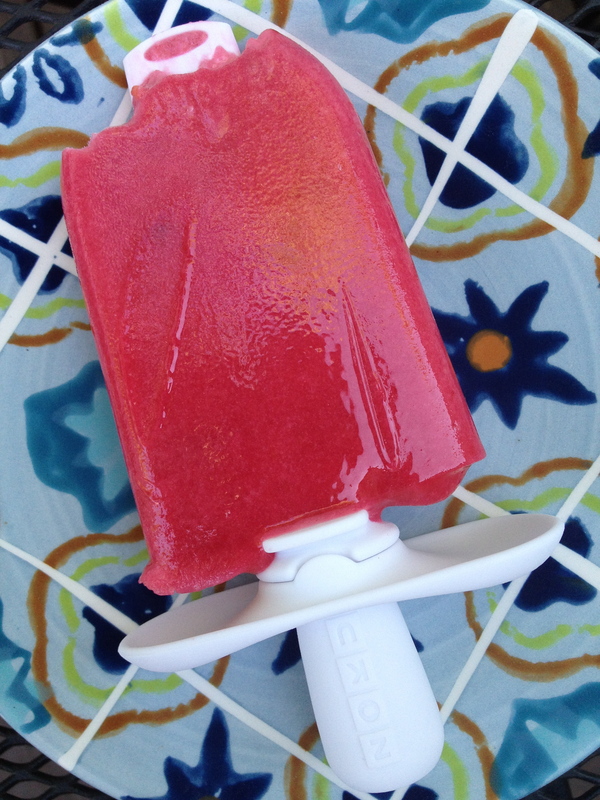 Inspiration for this frozen pop came from the People’s Pops cookbook. Upon flipping through it the other day a recipe for a roasted plum pop started me drooling caught my eye. When a trip to the Asian market resulted in a bag full of plump and delicious plums, I knew I would make these pops. The People’s Pops recipe suggests infusing the simple syrup with vanilla, cardamom, cinnamon, or cloves for a unique twist, but I had just purchased a gigantic ginger root and I knew where I wanted to go with these pops. For those that haven’t worked with ginger before it can be intimidating. Gnarly and misshapen, it’s easy to get flummoxed when it comes to deciding where to start. What a shame. It’s really quite simple. 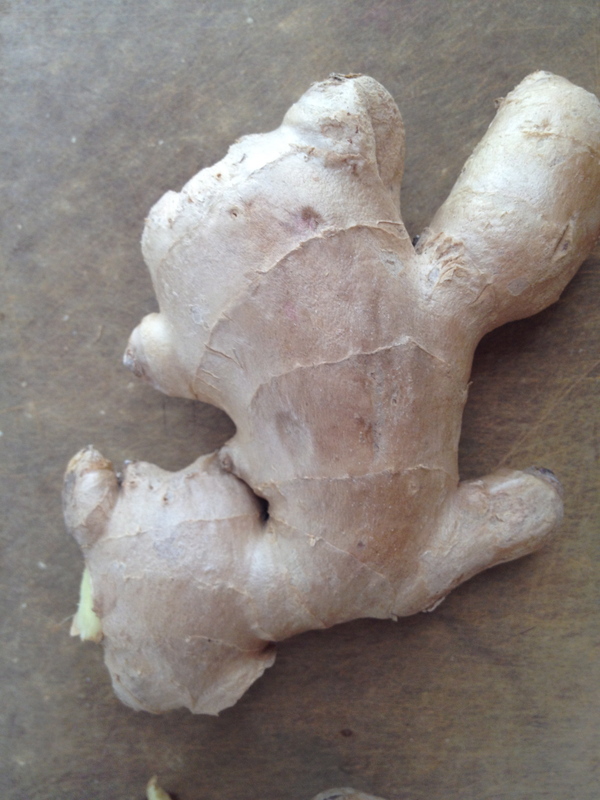 First look for ginger that is firm to the touch and has a smooth papery skin. If the skin is wrinkled or if the ginger feels a little soft, pass on it. Before using ginger the paper skin must be removed. 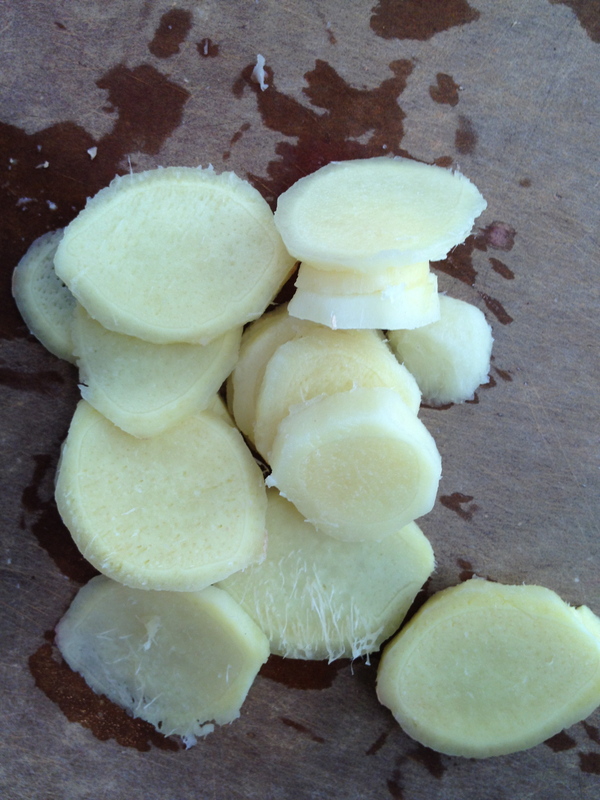 Many approach this task with a sharp paring knife and are rewarded for their efforts with a tiny piece of ginger. 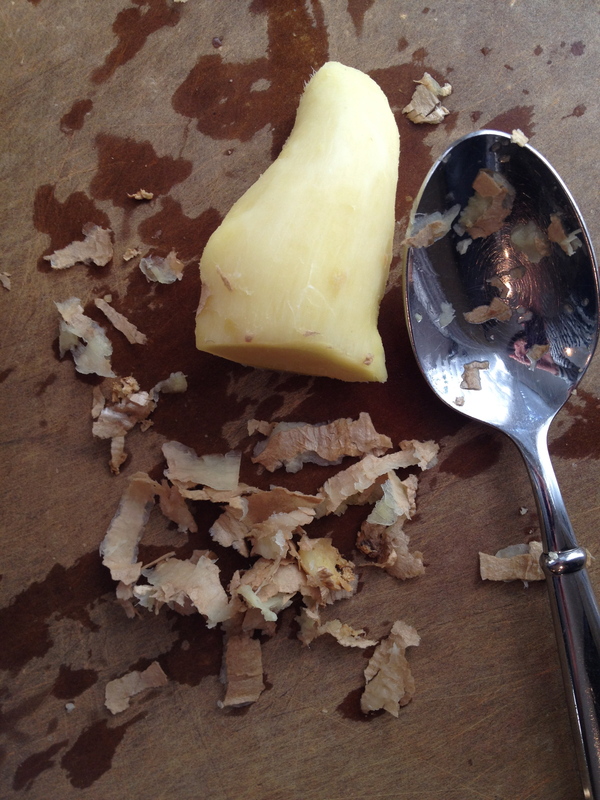 The side of a spoon actually works best for removing the papery skin without gouging the ginger in the process. It’s a little awkward at first, but with practice you’ll get the hang of it. To infuse the ginger into the simple syrup simply combine a heaping quarter cup of ginger slices (more if you love zing), 2/3 cup water, and 2/3 cup sugar in a small saucepan. Bring the mixture to a simmer, stirring occasionally to make sure the sugar dissolves. Once simmering, allow it to cook for 2 minutes before removing it from the heat and allowing it to sit for 15 minutes. Remove the ginger slices with a slotted spoon and use the ginger-infused syrup as directed. The prep for the plums is also straightforward. 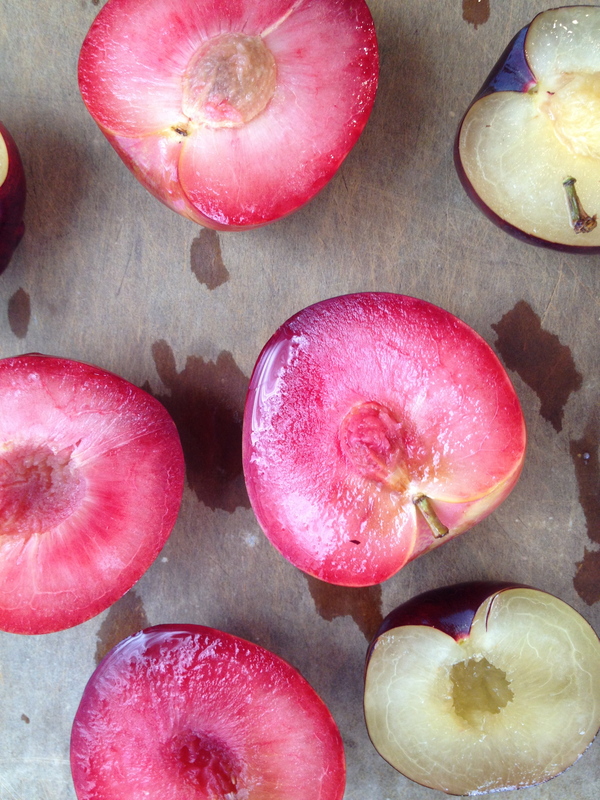 You’ll want to cut the plums in half and then roast them for about 25 minutes until they soften. This softens the flavor and adds nice complexity. It’s not totally necessary (I apologize for a recipe that requires turning on the oven), but it adds a nice touch and is worth the hassle. 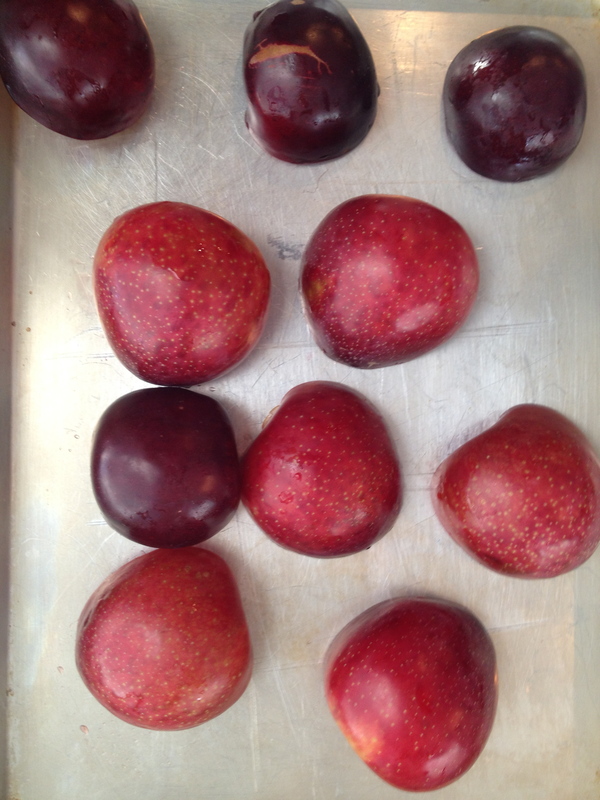 I roasted a mixture of red and black plums which yielded good results. 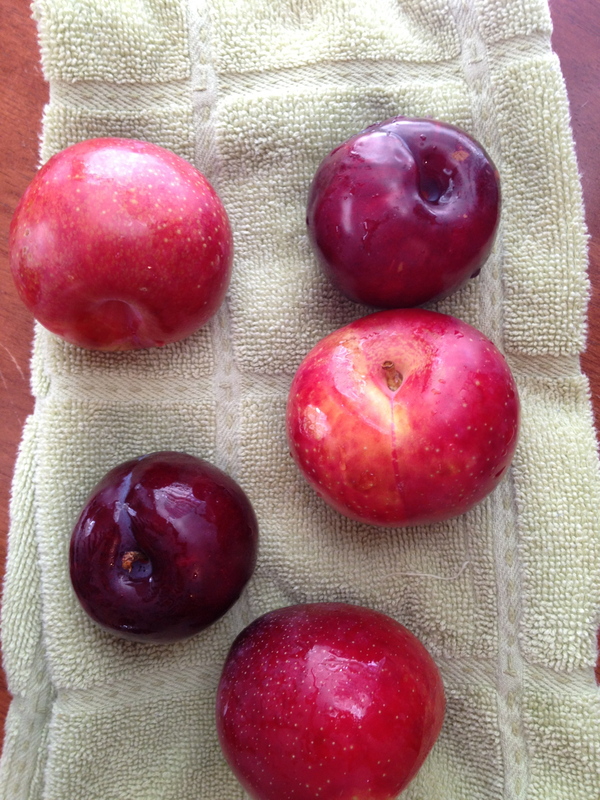 If you don’t want to roast both, roast the red plums as they have better color and will yield a prettier pop. 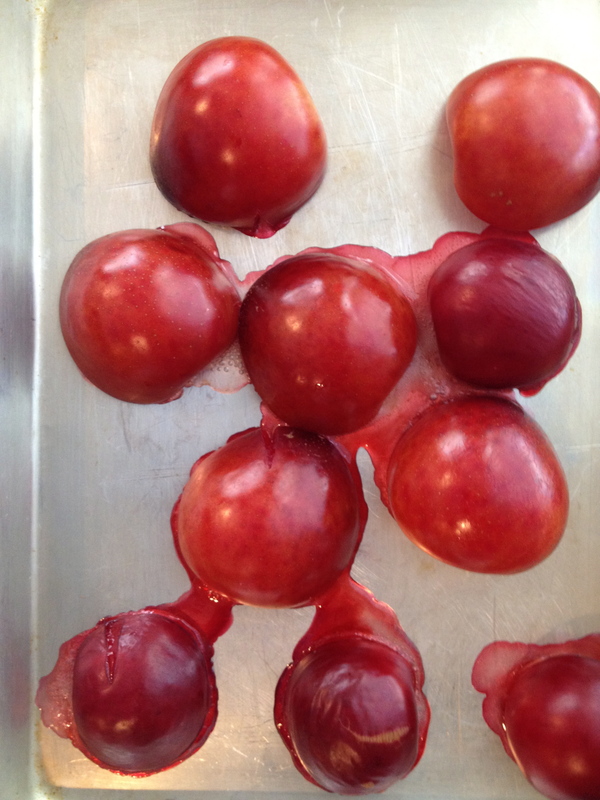 After roasting, remove the pits and throw the plums (skin and all) into a blender and puree until smooth. Stir in the ginger syrup and chill the mixture for 30 minutes in the refrigerator before pouring it into molds. 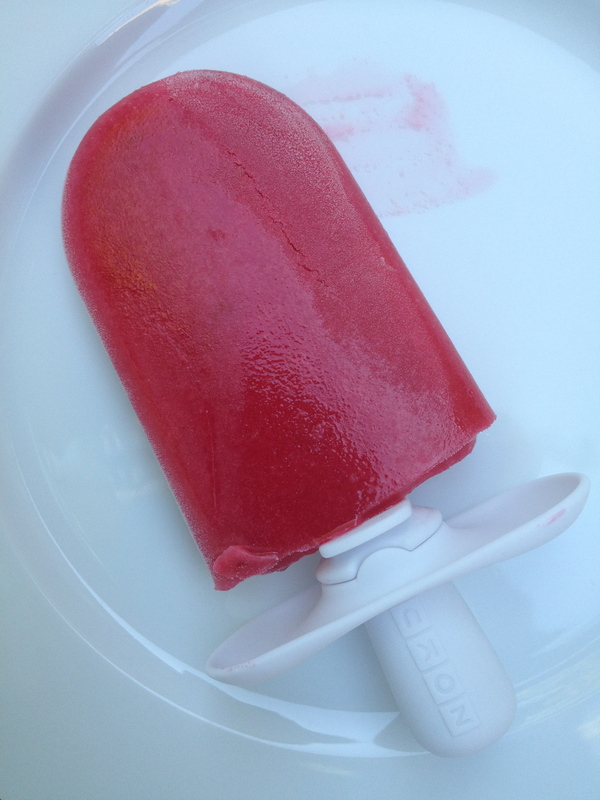 Depending on whether you are using a fancy pop maker or going old school with plastic molds in the freezer, it will take anywhere from 8 minutes to 5 hours before you can try your pops. Use this time wisely. Get outside and embrace the heat so that when you take that first lick of these roasted plum and ginger pops you’ll remember why popsicles are the greatest summer food. 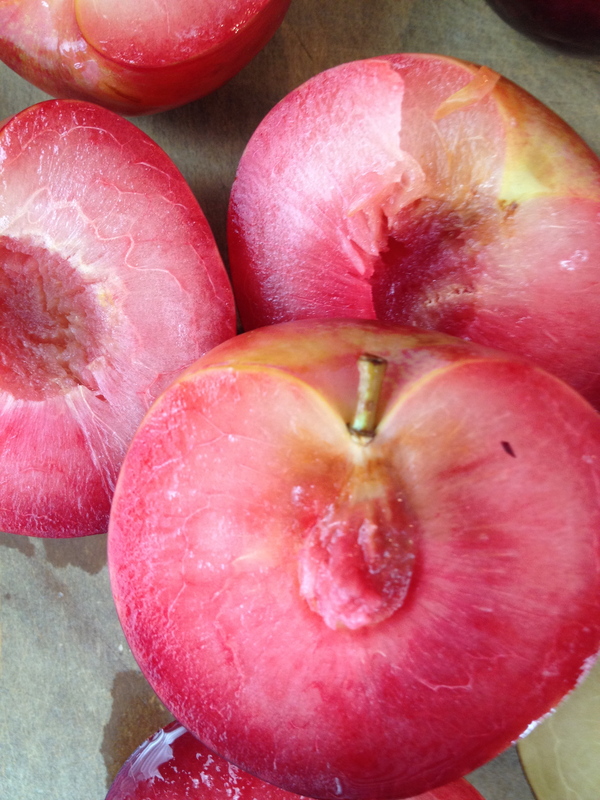 Red plums add great color so definitely use them here. I used a combination of red plums (14 ounces) and black plums (6 ounces). I have no complaints about the results. Preheat the oven to 350 degrees. Halve the plums (don’t worry about the pits yet) and place on a small baking sheet cut side down. Roast the plums for 25 minutes or until soft to the touch. Remove from the oven and let cool before removing the pit and tossing the plum and its skin in a blender. Puree until smooth. You should have about 1 cup of plum puree. In a small saucepan, combine the ginger slices, sugar, and water and bring to a simmer, stirring occasionally until the sugar dissolves. Once simmering, cook for 2 minutes then remove from the heat and let cool for 15 minutes. Remove the ginger slices using a slotted spoon and discard or save for another use. You should have about ¾ cup simple syrup. Stir the simple syrup into the plum puree and chill in the refrigerator for 30 minutes. 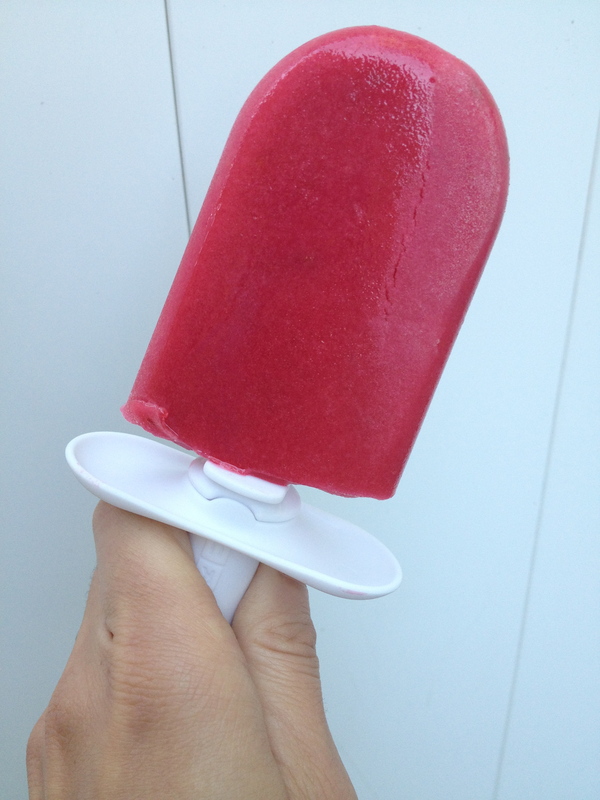 If using a pop maker like the Zoku quick pop maker follow package directions to make the pops. If using plastic molds, fill the molds with the mixture and let freeze for 5 hours before serving. Enjoy! Wow, these sound so amazing. I love popsicles in the summer. I used to pound Dole Fruit Juice bars when I was growing up. I can’t wait to try these hint hint. I am starting to drool. ha.